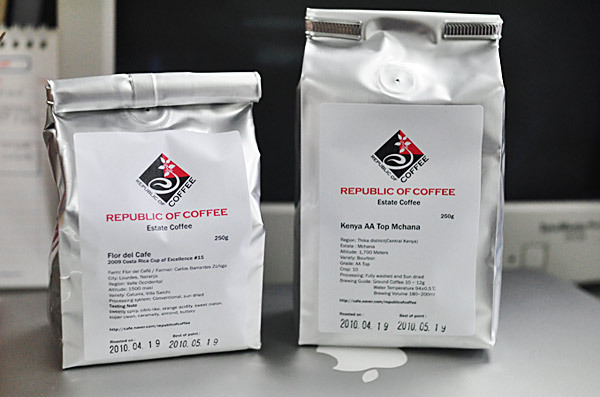 I received these two coffees from Lee Jong Hoon (Korean Barista Champion ’09) and his girlfriend and partner Seol Mi Gyeong, who run Republic of Coffee together. Two great people and very dedicated coffee professionals that I feel privileged to have met! The Kenya AA Top Mchana is complex and fruity. Dry red wine is the dominant flavor I picked up, followed by a mix of fruit notes that show themselves more clearly as the cup cools: tart grapes and berries, and notes reminiscent of slightly salty, tangy dried fruit. 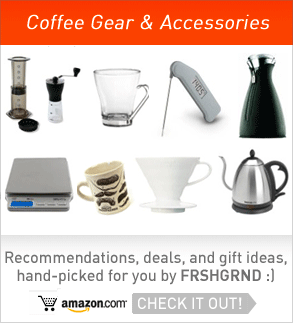 I brewed these coffees on a Hario V60 using a variety of ratios and grinds, but generally around 18-20g coffee to 250ml water with a grind a bit finer than what works on a Melitta pour-over.